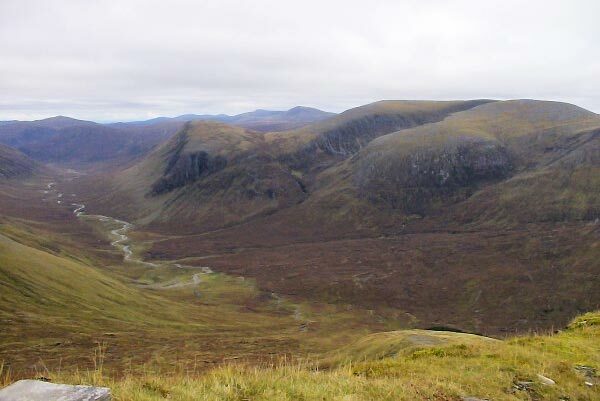 Maoile Lunndaidh is a remote and isolated peak. 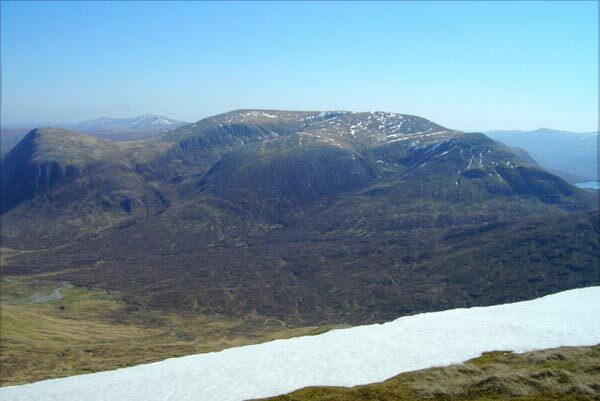 It is a large and complex mountain with two peaks (Maoile Lunndaidh and Carn nam Fiaclan) separated by a narrow ridge between two corries, Fuar-tholl Mor to the NW and Toll a' Choin to the SE. The only feasible access without camping is from Gleann Fhiodhaig to the N. The normal ascent routes, are the NNW ridge of Maoile Lunndaidh keeping E of the crags overlooking Gleann Fhiodhaig, or the NW ridge of Carn nam Fiaclan (996m) from the path by An Crom-allt. 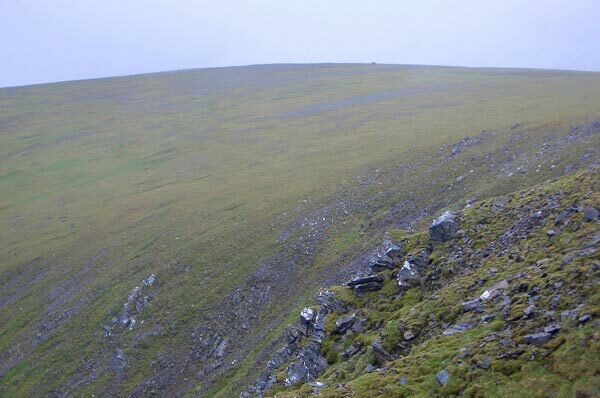 It is also possible to follow this path higher and ascend the W ridge of Carn nam Fiaclan. Maoile Lunndaidh as seen from Bidean an Eoin Deirg (East top) - 10th July 2010. Maoile Lunndaidh from Sgurr nan Ceannaichean. Flat summit and cairn of Maoile Lunndaidh from the south-west. 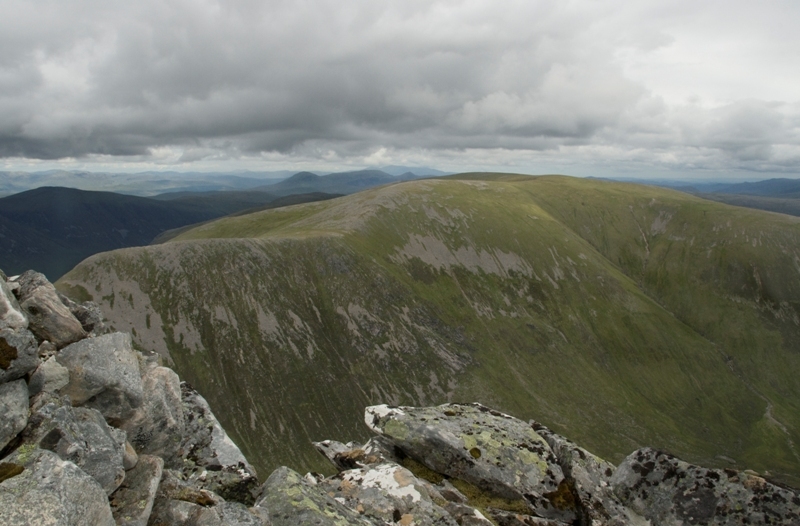 The summary information of one or more ascent routes that include Maoile Lunndaidh. 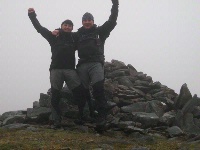 1 1171 m 26.05 km 7.5 hrs Maoile Lunndaidh Long route, but not difficult. Unbriged crossing of river required, which will be more difficult in wet weather. 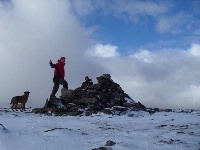 A bitterly cold and wet summit of Maoile Lunndaidh. No views. 26/09/2012. On top are myself, Karl and Oscar my Boxer....Great day! 26.2.11. Post a few words about Maoile Lunndaidh or read what others have had to say. I agree with the Loch Monar approach - as well as being shorter than from the north (took us 7.5 hours return from the dam) it is a lovely walk along the loch on a good path. It is pathless up the grassy slopes of the hill, the steepest gradient being at the bottom, then onto a ridge up to the flat top. I climbed this hill after several days of heavy rain. I chose to follow the SMC route, namely crossing the river just beside the small plantation, and crossing rough ground until ascending by the flank of Carn nan Fiaclan. Crossing the rough ground was at the entry level of the purgatorial spectrum, as was the climb up CnF. An inch of snow over the many boulders and rocks liberally strewn over most of this hill did not improve my humour. I could not find any paths. A good path is the best way to tap into local knowledge, but I couldn’t find one. 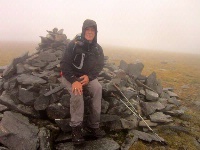 The price you pay for climbing a Munro less travelled I think. But I still had a satisfying and rewarding day! 9th June 2009. From Craig we left the track at the watershed, rounded the lower slopes of Sron nan Frianich, crossed An Crom-allt high up and ascended the west ridge of Carn nam Fiaclan. 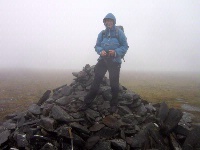 For variety we returned by Fuar-tholl Beag, just beyond Carn nam Fiaclan: not a good choice. There are numerous slabs of rock which are not shown on the OS map; easier grass is found by keeping to the east of this corrie. Oh dear, what a drag (from the north). Tedium only relieved by repeating obscenties, timed with paces, into the easterly gale - and playing in a couple of waterfalls lower down. This hill should be twinned with Ben Chonzie. Nice view from the top, however, and you could set up a pitch and putt on the summit plateau. Maybe from Monar Lodge next time - if there is one. Storer favours that way. Conclusion: this hill is for keen (daft) baggers only. Recommend Loch monar approach = 7.25 hrs for our party of 5, leave car at dam takes 1.5 hrs alongside loch to main bridge , superb route around corrie rim and huge cairn on plateau, good stalking path into corrie, with bridges over main water courses.